4-24-2019 Intel Guru Delta URGENT FROM IRAQI TV: US AGENCY...BAGHDAD NEGOTIATE TEHRAN TO BUY NATURAL GAS IN IRAQI DINARS... WOW...in IQD...that's great news..! 4-19-2019 Newshound/Intel Guru BGG Article: "Central Bank Basra branch introduces a window to provide small cash categories" Quote: "The head of the Central Bank of Iraq Branch of Basra...said that in view of the small groups of the Iraqi currency traded in the markets, the Iraqi Central Bank branch in Basra sought to provide these quantities for the purpose of facilitating the deal between a single trader And the citizen. He stressed that the provision of cash from all groups will facilitate the sale and purchase between citizens and owners of shops." The ONLY news that matters today..!! 4-15-2019 Newshound Guru Whitelions Iraq assures the International Monetary Fund (IMF) that it is adopting a new policy to diversify its sources of income. 4-15-2019 Newshound/Intel Guru Mnt Goat ...it is the Central Bank of Iraq that is responsible for the reinstatement of the Iraqi dinar not US banks. ...There is absolutely NOTHING coming from the CBI or within Iraq that can lend us to believe this is going to happen sooner than later. We are on track for early 2020 at best. 4-15-2019 Newshound Guru Don961 Article: "Agenda of the session No. (10) Monday, 15 April 2019" Quote: "First: Vote on the draft law amending the law of the recovery of Iraq’s money No. (9) for 2012... Second: Vote on the draft law amending the Companies Law No. (21) of 1997. (Committee on Economy and Investment, Committee on Culture, Information, Tourism and Antiquities)." 2 economic votes Monday... big vote coming Wednesday...imo. 4-5-2019 Newshound Guru G-Lin Article: "Parliamentary Finance intends to develop mechanisms to maintain the stability of the dinar exchange rate" Quote: "the financial Parliament is keen to enact the law of financial administration as it gives a complete road map of the financial policy in the country in terms of management of money and cash in the state', indicating that 'the change will raise the exchange rate of the Iraqi dinar against foreign currencies while maintaining the stability of inflation in the country." I think the vote on draft of the financial administration law is huge. This may open the door. If they vote on it or enact it, it could be what is necessary to change the value of the dinar. They told us it will raise the value... 4-5-2019 Intel Guru RayRen98 Three names have been submitted to PM Mahdi for the Interior and Defense Minister positions by Construction and Reform. Reportedly, Iraqi TV was broadcasting the adoption of a policy opening the country regionally and internationally in all applications. Newshound/Intel Guru Mnt Goat Posts 1 & 2 are from Noontime post today: 4-4-2019 Newshound/Intel Guru Mnt Goat Okay so everyone wants to know what happened with the reinstatement. We know that the CBI did in FACT have a March target...this target, like other targets, is predicated on completing certain issues/tasks. So what have we learned in March that we can take forward...about the timing of this reinstatement? We can clearly see by the dozens of articles that the cabinet is not yet completed and the hard requirement is still to “fully” complete the cabinet. ...We learned that the IMF is ready to go and is “demanding” the CBI to “free up the exchange rate”. We can conclude this means to put it on a float in the open marketplace (global exchanges). So the pressure is on...(post 1 of 3)...REPOST for context. 4-4-2019 Newshound/Intel Guru Mnt Goat We know that just recently the speaker of parliament Halboussi returned from meetings in USA with government officials. ...Primary conversations were of course on the presence of US military forces in Iraq. This was settled. Next, he was told he needed to get the...government formed and do it now. ...we now hear that April 9th is the target for the next voting session on these candidates. But that is a week away and another holiday is fast approaching. Next we learned that Iraq conducted a symposium or seminar on the “project to delete the zeros”. WOW! Why...would they do this if they were not serious about going ahead with it soon? They are trying to put the final touches on the process and educate those key people on what is about to happen...(post 2 of 3)....REPOST for context. 4-4-2019 Newshound/Intel Guru Mnt Goat Next we know that the Kurds or anybody else was not yet paid and to this date still the payroll files have not gone out. We are not moving into the fourth month without opening the 2019 budget. Conversation with my CBI contact on Monday: We were told the reinstatement rate is within the new budget and when it is opened they plan to pay out on the new rate. This why the hold up. Another cause of the holdup was a large sting operation on counterfeit currency coming from Iran. Billions of dollars worth of notes were confiscated. From my CBI contact they did run all the payroll files but they reflected the wrong rate under the program rate….oops!. They had to re-run the file and now it is based on the new rate. I was told the rate but also asked not to reveal it. I was told they will definitely pay the Kurds this week. We can expect to see articles news on this and the reinstatement may happen VERY soon afterward...(post 3 of 3)... 4-4-2019 Newshound Guru MilitiaMan Article: "Association of Iraqi private banks holds a preparatory meeting for the day of financial inclusion" Financial Inclusion is a hot topic for not only the IMF but the Bank of International Settlements and the World Bank. Think about it why are they working so close with Private Banks? Because, imo those that have a lot of wealth or will have a lot in the short term will use them... They will bring in their wealth to the banks...to exchange it into the new products. Won't Private Banks need the new small category notes to facilitate their new beginning into a market economy? The wealthy own businesses and will need new product for daily transactions. ...They will also need the ability for the markets to do Foreign wire transfers for those that do international trade. 4-2-2019 Newshound Guru larrykn Article: "Communications: Internet will improve soon" Quote: "The communications Ministry announced, that the reality of the Internet will see significant development during the coming period..." these are the things I like seeing, they are moving in the right direction...less talk more action. 4-2-2019 Intel Guru MarkZ In Iraq-I spoke with a contractor friend I know...he repairs power plants and power systems... They are very keyed up...they thought the new rate was to show on Saturday (I wonder where they got that idea...LOL..! )...they are waiting...lots of news on changing values and re-instatements... They have started using gold coins to pull large notes off the street...they are actively trying to get larger notes off the streets.... (Now comes the drama he always brings) There are expectations that we will see things happen...(DELETED)…I really hope that is true...I am nervous to tell you this – but I believe we are past the point of no return…I still am looking for the smoking gun to go with it and see for myself that its actually there. (posted because it was there, and spoke of the use of gold coins). 4-2-2019 Intel Guru Frank26 [via Clare] "IT'S COMING...IT'S HAPPENING ....THIS JOURNEY INCLUDES AN END" 4-2-2019 Intel Guru RayRen98 ...UPDATE...A Parliament spokesperson is on Iraqi TV stating that the names for the remaining cabinet positions will be presented and voted on after the April 9 albeit this is a direct contradiction from Sunday's TV announcement of the cabinet selections being concluded this week. Time Will Tell...if it even matters? A World Bank representative was interviewed and stated that after the cabinet completion, the Iraqi economy will experience a remarkable recovery. That announcement in Monday's mosque session indicated something very noticeable taking place by Tuesday evening...so, wait we shall! 4-2-2019 Newshound Guru larrykn the IMF pushing them is good but we need to look at where they are at and can they rv at this time, that is the question...corruption, security, investment, are those things ready? I don't think so. 3-30-2019 Newshound/Intel Guru Mnt Goat ...hold on to your seats and don’t fall off since I am going to give you some great news today. Finally, some more breaking news in the right direction for Iraq... 1. Quote... "The International Monetary Fund (IMF) is therefore demanding Iraq to free the exchange rate!" This issue is now becoming imperative since Iraq is having trouble trading with its neighbors... without a real rate. ...The IMF is now aggressively pushing the CBI to reinstate the IQD... 2. Quote... “Abadi revealed his decision in May 2018 to arrest former Prime Minister Nuri al-Maliki” ...This DOES NOT say Maliki is already arrested. It is only telling us an intent to arrest him. Abadi has no official capacity to arrest Maliki. Are these both issues exactly what we have all been praying for...? 2-22-2019 Intel Guru Delta "REPORT: IRAQ ANNOUNCES THE DISMANTLING OF THE LARGEST FUNDING NETWORK FOR "DAHESH" Quote: "A recent report said that the State of Iraq announced the dismantling of the largest funding network of the group "Daash" terrorist." ...IMO THAT IS WHY THE CBI DID NOT RI YET... BUT NOW IT'S CLEAR TO GO...THIS IS HUGE...ALSO THEY WERE USING THE CBI AUCTIONS FOR FUNDING...THAT'S WHY IMO THEY HAVE TO STOP THE AUCTIONS ASAP.. 2-22-2019 Newshound Guru Kaperoni ...the IMF cannot force CBI to do anything...that being said the CBI is a member in the IMF and agreed to the conditions of that membership and one of the conditions stated says member countries have to strive for Article VIII as soon as possible. So I do not think the CBI will drag their feet to meet move from Article XIV to VIII much longer when that is the intent in the plan. ..... MAYBESOON..! ( Updated: 2/22/2019 ) Official Central Bank of Iraq (CBI) Dinar Rate: 1190 IQD to 1 USD Dinar Market Rate: (CBI last reported 2-20-2019) 1193.008 IQD to 1 USD ** - Rates Are Within IMF 2% Rule: YES ** - Are Rates IMF 2% Rule Compliant for 90 Days:YES (maintained since ~Mar. 15, 2018 & Iraq Market since ~Nov. 14, 2018) I would view the following "Opinions" with great skepticism, and mostly as B.S. because there is no confirming evidence .... RON 2-22-2019 Intel Guru Bruce [via PinkRoses] There was an outside shot that we would get the start Thursday. It did not happen. ...It didn’t happen because our lovely banks were not completely compliant...Wells Fargo, Bank of America, and Citibank were not complete or compliant with the RTGS...by 3:15 pm Thursday afternoon - all the major banks were compliant...That is why we couldn’t go Thursday, but we could be in position to go after today. I think we can finally call Iraq complete. They started paying out their citizens last...Saturday or Sunday...paying them all at a new rate on their Qui cards. These were salaries. This was money that was paid as a result of the oil and gas law, the so called: HCL, Hydro Carbon Law...(post 1 of 2)... What are his sources about the banks (B.S.) and Iraqi salaries. 2-22-2019 Intel Guru Bruce ...We are hearing really good information. We think this is it...I am telling you things are moving...This RV/GCR has been rolling out slowly since this past Monday. ...It is like that Heinz Catsup commercial, the Anticipation Song. The catsup is pouring out, but taking a long time to pour out. That is like what we are experiencing. ...I have been told ??? source..? to be alert...I do not know when it is going to happen, but I do feel good about where we are in the process. I told you I wasn’t going to call it, and so I am not. I can’t, because I could be wrong. I am excited as I ever been for this to go thru...(post 2 of 2)... (more B.S.) 2-22-2019 Newshound Guru EHankins Article: "Signing a commercial economic agreement between Iraq and Kuwait" Quote: "the Iraqi-Kuwaiti agreement is a first step in the right direction to activate economic and trade relations and overcome the problems of the previous phase." [This is a significant piece to understanding where we are in the MR...we are at the doorstep to our reward. Just ask yourself, why was this done now and so quickly.] I couldn't agree more .... in my opinion this screams we indeed are on the other side .... both feet planted firmly because we have been prepared in advance. 2-22-2019 Intel Guru MarkZ [Q? : Do you feel the Iraq government must be fully seated before the RV can take place?] I absolutely say no. They have enough of a government seated. [Q? : Do you think we will RV before Prez gets back from China?] Yes I really think we will have the RV before then. I am still looking for the month of Feb. [Q? : Do you think this will be a taxable event?] From talking to many people at all levels of Gov and banking I do not think it will be a taxable event for the currencies. [Always consult with your tax professional at the appropriate time] [Q? : anything on the Dong?] I am still hearing the rate will be $2.0 to $2.20 on the dong. Hoping to have more news tomorrow [Friday]. (More B.S.)..! 2-19-2019 Newshound Guru chattels Article: "Tuesday, February 19, 2019 Security In Iraq Feb 8-14, 2019" There was another week with few security incidents in Iraq. For almost four months now the country has averaged 20-30 security events each week and the second week of February was no different. 2-19-2019 Newshound Guru Kaperoni If and when the CBI begins to float the dinar it could take 6 months to 2 years to delete the zeros (raise the value enough where the zeros are gone). Remember, if the CBI is going to do this event it will be in conjunction with investment capital coming to Iraq. The more capital the greater the inflationary pressure meaning the faster it could rise. The 2012 IMF Article IV Consultation with Iraq descibed the process and event as the Balassa-Samuelson effect. 2-10-2019 Intel Guru RayRen98 Iraqi News: The federal budget is ready for implementation by the ministries and the governorates, although not yet published in the Official Gazette. The ratification by the Presidency of the Republic on the budget makes it considered an effective and enforceable law. This gives the ministries and the provincial governments the right to legally use the budget to implement their plans. Iraqi TV reporting Hakeem and Abadi this morning saying how important it is to complete the cabinet As Soon As Possible. 2-10-2019 Newshound Guru MilitiaMan [...The investment conference, which is/was to begin tomorrow (2/10), has now been pushed back to this summer...??] Yes it appears as such and in my opinion, it was due to that they haven't shown the rate yet. I was expecting them to cancel with out it. ...There is nothing bad out there to support we are not in a good place today! Those that were expecting the final rate ahead of the conference, knew in advance if the rate didn't change they would not be having one.. imo..
2-6-2019 *** Dinar News Update *** The 2019 Iraqi Budget was officially signed into LAW on Monday. Article: "The budget for Iraq for Fiscal Year 2019 officially became law on Monday with the signature of Iraqi President Barham Salih." This is a milestone that needed to happen for Iraq to be considered a functioning country. (REPOST) IMPORTANT: Now we await the printing of the 2019 Budget in the Gazette so it becomes official law. NOTE: The CBI website seems to be down, and I've been unable to log in. (Interesting) 2-6-2019 Newshound Guru Kaperoni ...The dinar will never revalue or re-instate. It is a process that will take time. Once they get off the peg and begin to float. 2-6-2019 Newshound/Intel Guru Mnt Goat We are waiting for the opening of the 2019 budget to begin the reconstruction. In doing so we are hoping this will also inspire the reinstatement of the dinar so investors feel comfortable coming into Iraq and investing knowing the currency is worth something and they can easily trade it outside Iraq. The updates to the investment law of 2015 are also in place and so investors can now more easily transfer funds in and out of Iraq under the law. There are also international mechanisms in place to facilitate this action. But one piece that is really needed is to have the Iraqi dinar once again listed on the global currency exchanges...It was not until the UN resolution in 2003 that ripped the IQD off the exchanges. Now they must get it listed back on...(post 1 of 2)... 2-6-2019 Newshound/Intel Guru Mnt Goat ...We know that in order to conduct business with the rest of the world they must significantly increase the rate of exchange on the IQD when they do post it back. Like I keep telling everyone - the VALUE is found in the Iraqi dinar - it is just that the RATE does not now reflect the true value as it is being artificially suppressed due to sanctions. Oh – but we know that officially the sanctions have been “fully” lifted already since 2018. So what is the hold up then? We know for a FACT that the month of January is the BEST (but not only) month to reinstate the dinar. We just witnessed two attempts to do it in January and both times the NSA (national security agency of the US) stopped it for security reasons. I am now hearing this was due to the sanctions imposed on Iran and that the US needs assurances in two areas before this can move ahead – 1)US forces are secure in Iraq; 2)trade with Iran will not be conducted in US dollars ...This all I know and we are still in a waiting mode to how all of this gets sorted out...(post 2 of 2)... 2-6-2019 Newshound Guru Adam Montana [Q? : With all that has happened they surely "can" RV and I as everyone want them to. However, what will make them want to do it now vs a month, or say 6 Months from now? What makes the trigger be pulled?] One set of letters: HCL. That, combined with the extremely positive budget. This is happening now, not 6 months ago, and not 6 months from now. 2-6-2019 Intel Guru Bruce The information over the last couple of days has been relatively little because whereas we have a number of sources that comes from banks, financial groups and institutions, and other providers most have gone entirely quiet...Either they are under an NDA or a gag order and they have been asked to stay that way. That is a very positive sign for us... I know that the rates have continued to rise slowly...We got good indicators of a slightly increase of the main ones we tend to follow (Any exchange other then the CBI website has no real impact on the value of the IQD, they are simply reflecting where it might be with fees included as other currencies vary ever so slightly - they are meaningless until the IQD moves to Article 8 and becomes an internationally traded currency once again)...I think in this particular case if you are going to be looking for a front screen rate (BS...no front screen rates - it's not traded...only the CBI rates...!) there is no hurry because the rates are going to continue to go up...It is going to be an interesting next few days... Bruce lives in a fantasy world of his own imagination...IMHO..! 2-6-2019 Newshound Guru MilitiaMan Article: "Published the text of the Budget Law 2019 after the ratification of the President of the Republic" Well, imo every citizen in Iraq, including the politicians are looking for the public announcement now on the results that should be found within the 2019 Budget. The rate for many things, and imo most likely HCL monies, are in there, which has to be what everyone in the world that owns Dinar is waiting for... The citizens may get retroactive pay too...So by this and with Frank's [Guru Frank26] opinion, among others, everything is done and we wait for it to come to us. 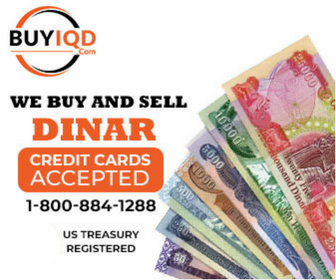 2-6-2019 *** Dinar News Update *** The 2019 Iraqi Budget was officially signed into LAW on Monday. Article: "The budget for Iraq for Fiscal Year 2019 officially became law on Monday with the signature of Iraqi President Barham Salih." This is a milestone that needed to happen for Iraq to be considered a functioning country. (REPOST) 2-6-2019 Newshound Guru MilitiaMan Article: "Published the text of the Budget Law 2019 after the ratification of the President of the Republic" Well, imo every citizen in Iraq, including the politicians are looking for the public announcement now on the results that should be found within the 2019 Budget. The rate for many things and imo most likely HCL monies are in there, which has to be what everyone in the world that owns Dinar is waiting for... The citizens may get retroactive pay too...So by this and with Frank's [Guru Frank26] opinion among others everything is done and we await for it to come to us. 2-5-2019 Newshound Guru Adam Montana ...the stars are lining up very nicely right now. ...First, the budget was submitted, signed, and looks like it will be passed, with a HUGE keynote - a significantly acceptable portion of the budget going to the Kurds. This has been a major point of contention between the parties over the years, in fact it’s possibly the biggest point of disagreement and reason for delays in the budget approval process in recent history. ...the budget...needs to be published in the Gazette to be official. This may be happening yet this week, and if it does...that will be insanely quick...(post 1 of 2)... 2-5-2019 Newshound Guru Adam Montana If you’re not already squirming, let me tell you - this is awesome news. A happy GOI is a GOI that we can get behind, because it’s one that is more likely to RV. And this is possibly the happiest we’ve ever seen them! ...we have more...I’m trying to contain my excitement...We may have an HCL agreement shortly! ...THIS is the kind of movement we need to see for an RV to happen, and I didn’t want to release the news without a full confirmation...you know I’ve been on an “HCL-requirement” ...No HCL = no RV...and now, after a long ride, it's not just on the horizon - it's coming at us, lights flashing and horns blaring! ... the time that we have been waiting on may be over. There is news out right now that is more encouraging regarding the HCL than ANYthing I have ever seen, and that means we’re almost there...(post 2 of 2)... 2-5-2019 Newshound Guru Kaperoni Huge juice this morning...the US Treasury acknowledges they are ready to support Iraq and Kurdistan in promoting a market economy. This announcement is probably the best news that Iraq is ready to open up to the world's financial system. 2-5-2019 Newshound/Intel Guru BGG ...we have PLAINLY published the FACTS surrounding the Kuwaiti reinstatement over and over and over. It was nothing like the various rumors portrayed on the internet... Any comments made by President Trump regarding prosperity are tied directly to his policies and have nothing to do with any future value change of the Iraqi Dinar. Value change or no – the math just doesn’t add up. A massive change in Dinar value doesn’t even bump the needle of the US financial engine. [reference Guru RVAlready post 2-4-2019] That's All Folks ... For Now..! 2-5-2019 *** Dinar News Update *** The 2019 Iraqi Budget was officially signed into LAW on Monday. Article: "The budget for Iraq for Fiscal Year 2019 officially became law on Monday with the signature of Iraqi President Barham Salih." This is a milestone that needed to happen for Iraq to be considered a functioning country. Stay tuned as the gurus opinions are posted on the importance of the budget law to a possible increase in the value of the dinar... 2-5-2019 Newshound Guru Kaperoni So the 2019 budget was signed into law today...those hoping for a RV or some other overnight change in value as a result will be disappointed. Not how it works... 2-5-2019 Newshound Guru Adam Montana Article: "The President of the Republic approves the Federal Budget Law" [Hope it doesn't take 2 weeks to get published in the gazette...] ...the timing of this publication will be very important... 2-5-2019 Newshound Guru MilitiaMan Article: "Central Bank: We bought 20 trillion treasury transfers to move the market" Quote: "With the increasing confidence of international banks in the Central Bank of Iraq and the lifting of restrictions and barriers" I really do think this article is massive in that it shows they are ready to defend their new currency!! They have now told us they are ready to go live with an international exchange company that will be traded on the Iraq Stock Exchange...In addition... we see the lifting or restrictions from the CBI directly. The CBI is talking very loud...imo. Well, them telling us they have lifted restrictions and now having populated them selves with 20 Trillion in treasuries to support their currency, it is all but go time. imo. 2-5-2019 Newshound Guru Kirk H. Sowell So after a long delay, today [Monday] Iraqi President...signs the 2019 budget into law. The delay was due to parliament wanting to make amendments to the budget after it was "passed" on Jan. 24. They just sent it to Salih two days ago. 1-23-2019 Newshound/Intel Guru Mnt Goat THE NEWS ON THE IRAQI DINAR REINSTATEMENT: There is some good news as I know the CBI desperately wants to move ahead with this process but is being held back. Over this past weekend we had a situation when the CBI wanted to reinstate and tried to pull the trigger. It was unsuccessful. Some ask me how did I know since no one knows a date or a firm rate. ...I did not know a date or a rate until AFTER the fact. How could I? I just happened to have called my CBI contact to get an update and this is what I was told. Are they lying to me? ...maybe …but I don’t think so. The very good news is the CBI still has plans for the month of January and we still have 9 days remaining… 1-23-2019 Newshound Guru Kaperoni From what I am reading today it sounds like parliament passed the budget today at the 7pm session. Need more confirmation but looks like good news. 1-23-2019 Intel Guru RayRen98 THE WAIT IS "SUPPOSEDLY" OVER...IT'S DONE...IT'S FINISHED...THE RV IS ON ITS' WAY...NO MORE TALKIN'-NO MORE TESTIN'...BRING IT ON ALREADY! ITS YOUR SEASON!!! IF NOT THIS WEEK...I'LL BE SURPRISED BIG TIME...We are just waiting for the call any day... or any hour . . .or any minute. Time will tell. 1-23-2019 Newshound Guru Breitling …the price per barrel has gone down a lot faster than what they anticipated. And the United States is taking over the world market faster than anticipated…remember their [Iraq’s] bottom line is $54-$55 per barrel Brent Price…What happens to their country when they need more? Guess what that goalpost moves and they are going to need more money…Article “U.S. could soon pump more crude than Saudia can at their peak”…we are moving a lot faster than we thought we were going to…this should make you happy. That’s good news. That’s super good news…that’s what I love about the information coming out of the oil industry. Because it means everything for us. You should be very very happy. 1-23-2019 Intel Guru Bruce [via PinkRoses] ...a lot of our sources have been silenced...they are either on gag orders, some...put under an NDA, and a lot of them just are unable to speak anymore because this is just happening so close right now. You know about the World Economic Forum in Davos, Switzerland...we do understand Iraq will announce their new currency and their new rate on the Iraqi Dinar at Davos. When it comes to our timing, we have heard really good things about Tuesday, Wednesday, and Thursday this week. I just can’t call one day or the other, but I think we are looking very strong for this week. I am feeling very good where we are...If anything I am more excited than ever... I think we are going to be pleasantly surprised in the next couple of days. 1-23-2019 Newshound Guru MilitiaMan Article: "Abdul Mahdi "comfortable" for his long stay on the head of the interior and defense .. Sadr does not mind" This is very good news...Now that that is effectively settled imo, the next move is the rate announcement before the budget...?? hmm we shall see and possibly before they vote on Wednesday or Thursday. Gotta vote on what it is in it right? So now that he (Mahdi) has Sadr on the deck allowing Mahdi to head the Interior and Defense, he can now focus on the announcement of not only his first 100 days but, what the citizens want to hear about the CBI the future of their new money...imo...We shall see...That is not something to take lightly... We know Mahdi can make the Art 8 announcement and it would be a very appropriate time to do so...imo.. Let see how it rolls. But, with the Interior and Defense out of the way nothing left but the Art 8, rate for the budget that the Big 3 Firms most likely approved of Sunday.. imo..
1-21-2019 Newshound Guru MilitiaMan Article: "The supervisory and auditing bodies meet in the Central Bank of Iraq " Quote: “a meeting of the bank held today under the chairmanship of the Governor, and the presence of the President of the Office of Financial Supervision, the head of the board of Securities, and the captain of accountants and auditors, and Vice-President of the Iraqi Association of Certified Public Accountants, and representatives of international audit firms (KPMG, Ernst & Young, Price waterhouse Coopers)." Alak is sitting at the head of the table and has everyone's attention...The attention of three of the largest firms in their line of work in the World. They will need to coordinate with each other from here on out. We should all be smiling about now with the timing of the meeting. The numbers not only on the new notes will have to be accounted for and well managed just as contracts will be when during and after the (RD/RI/RV) process of completion of the Monetary Reform and the re construction of the country...IMO. 1-21-2019 Newsdhound/Intel Guru Mnt Goat [Is the CBI saying replacing the larger 3 zero notes with new currency?] If they remove three zeros the IQD it will be replaced by a new lower category currency thus when the CBI reinstates the currency they will have to raise the rate. But they do not need to get all the 3 zeros notes changed over. In fact the plan does not call for all of them either. Once the reinstatement occurs they told us it will take up to 10 years to get all these 3 zero notes out of circulation. So the reinstatement is also pivotal in this process. 1-21-2019 Intel Guru Frank26 Article: "The supervisory and auditing bodies meet in the Central Bank of Iraq" Quote: “a meeting of the bank held today under the chairmanship of the Governor, and the presence of the President of the Office of Financial Supervision, the head of the board of Securities, and the captain of accountants and auditors, and Vice-President of the Iraqi Association of Certified Public Accountants, and representatives of international audit firms (KPMG, Ernst & Young, Price waterhouse Coopers)." INTER .............. NA ...................TION ............... AL !!! 1-21-2019 Newshound Guru MilitiaMan We just watched a few of the largest firms in the world have a meeting with Alak today. All in the same room. ...Iraq is ready and they had to get on the same page for whats coming now, as it will be different than before. imo.. The meeting with those who dot the I’s and cross the T’s were at the central bank today and word is there was cargo leaving the banks at night.. Makes one wonder at this present time why? Don’t forget, the central bank issues cash... all imo. 12-27-2018 *** Iraq News Flash *** U.S. President Donald Trump made a surprise visit to the troops in Iraq on Christmas evening. It's reported he assured Iraq there are no plans for the U.S. to end operations or support in the region. 12-27-2018 Newshound/Intel Guru RVAlready ...I feel we are headed for the RV. The 2019 Iraq budget is written in post-RV numbers (billions, not trillions, of dinar). Iraq needs this RV to move forward. The CBI is clearly planning to get this done. To me, everything else is just noise. 12-27-2018 Newshound Guru Kaperoni Quote from John Bolton, Assistant to the President for National Security Affairs: "In Iraq, President Trump spoke w/ US military leaders about the progress to secure total victory against ISIS. He also spoke w/ Iraqi Prime Minister Adil Abdul-Mahdi, and invited him to visit the White House. We look forward to hosting him DC." 12-27-2018 Newshound/Intel Guru Mnt Goat "PRESIDENT TRUMP MAKES CHRISTMAS VISIT TO TROOPS IN IRAQ" So this really happened. It has NOTHING to do with the reinstatement of the currency...However, it a sign to us that the country is getting safer. But a “state” visit was NOT the purpose of this trip for Trump. He promised to return when the government is “fully” formed. Wow! This simply a visit to the armed forces base in Anbar...the visit was not actually surprising to the Iraq government but was asked to be kept quiet. Trump did say he fully intended someday soon to return for an “official state visit” but only when Iraq was ready. 12-27-2018 Intel Guru ADMINBILL Keep your eye on the ball during the coming week and into 2019...Remember, this is a process...Truth will soon prevail...We win. 12-27-2018 Newshound/Intel Guru tman23 Damn interesting that Secretary Treasurer Steve Munchin shook the markets after it leaked that he called banks to check if they had enough liquidity...WELL DO THEY?? AND WHAT IS ABOUT TO COME? It is getting close to the New Year when Iraq MUST do the ZEROS...we shall see what that entails as this is also the year for USA infrastructre rebuild to kickoff...Like what i'm seeing...hopefully the dinar bares fruit shortly..! 12-26-2018 *** Dinar News Flash *** U.S. President Donald Trump made a surprise visit to the troops in Iraq on Christmas evening. It's reported he assured Iraq there are no plans for the U.S. to end operations or support in the region. 12-26-2018 Newshound/Intel Guru Mnt Goat Article: "THE PARLIAMENTARY ECONOMY REVEALS EFFORTS TO AMEND THE INVESTMENT LAW TO INCREASE OPPORTUNITIES" Folks this is a BIG one. This law needed to be amended to facilitate foreign investors into Iraq.This was noted in the Kuwaiti conference and so finally we see it amended almost a year later. They sure do take their time…lol...We know for a FACT that the reinstatement of the dinar is supposed to be the launching pin of the 2018-2022 reconstruction effort. Article quote: “and to raise the market value of the Iraqi dinar” 12-26-2018 Newshound Guru Kaperoni Article quote: "President Trump and the First Lady traveled to Iraq late on Christmas night to visit with our troops and Senior Military leadership to thank them for their service, their success, and their sacrifice and to wish them a Merry Christmas." Trump makes a surprise visit to Iraq. 12-26-2018 Newshound Guru chattels Article: "Iraqi blocs resume their dialogues for "consensus" on the remaining three ministries of the government" Quote: " ...the remaining three ministries: the defense, the interior and justice, waiting to vote in future sessions. " 12-26-2018 Newshound/Intel Guru Mnt Goat HERE COMES ARTICLE 140, JUST IN TIME? Quote: "The President of the House of Representatives, Mohamed Halbusi, the request to host the Implementation Committee Article (140) of the Constitution to discuss the reasons for not completing the work that was formed for it." So here it is again. Folks this is not my FAKE news. This is real and finally it seems that going to implement Article 140 or pursue it again. Many say it is already done. NOT true. Like I keep telling everyone there needs to be a formal referendum (that is, already written and send to parliament) then it needs to be voted on and implemented. Then it is done. 12-26-2018 *** Dinar News Update *** Two ministers positions have been voted on and seated. Only 6 seats remain open...these include the Interior, Justice and Defense Ministries. The latest guru posts will continue below...REPOSTED..!